Free female sanitary products are now being offered to students as part of IGNITE’s “Pads & Tampons” pilot project. 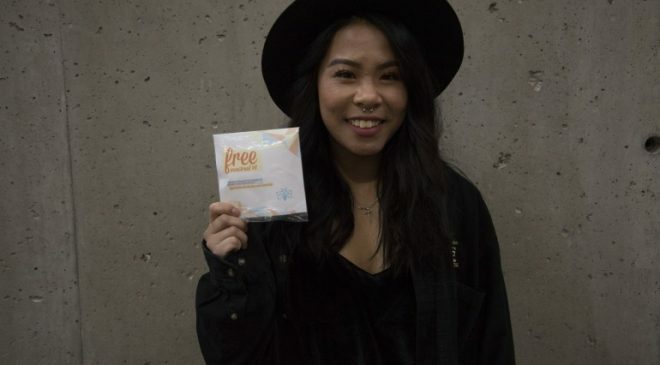 The person behind this initiative is Lakeshore IGNITE Vice President Allisa Lim, whose platform during elections was the promise of free menstrual kits. After two semesters spent campaigning, she’s happy to see her project finally realized. A big part of this project is about eliminating the stigma surrounding menstruation, Lim said. IGNITE wants to utilize the kits to start a conversation, as well as provide free products to those in need, she said. Lim credits her transgender brother as being an influencer behind her pursuit of this initiative. At the beginning of the project, Lim personally contacted tampon manufacturer Procter & Gamble and received 4,000 free products. It was small milestones like this that led to the initiative finally being launched, Lim said. There were some minor obstacles that Lim had to face in bringing this project forward, largely due to the kits being displayed in public spaces. “I think people were scared that students were going to be uncomfortable having these products around,” Lim said. “And maybe people would end up stealing them because they’re all free. But to me, those things didn’t matter. The free kits are available at the North and Lakeshore campuses in their respective Health Centres, LGBTG+ Centres, and IGNITE offices. They can also be found in room 108 at Guelph Humber. Each kit includes two tampons and two pads, both regular size. The packaging also features a survey link which Lim encourages everyone to fill out in order to make this pilot project permanent. The survey is open until the end of the semester on May 1. Since being launched in January, Lim said they’ve received largely positive feedback from the survey. About 166 people have filled it out already with about 95 per cent of students saying they love the kits. Some commented they wished the packaging were more discrete or that they wished the kits were available in a different area. Solest Waterman, a first-year law clerk student at Humber, thought the free kits were a great idea. Vanessa Green, also a first-year law clerk student, appreciated the kits’ discrete packaging. People can’t tell what’s inside, she said. Both Waterman and Green agreed that an improvemens to the project would be placing the kits in different locations, such as in the bathrooms. “It’s more private that way,” Green said. All feedback from the online survey goes towards making the project better. Lim hopes to see her initiative become permanent and add more products, like deodorant and razors. With IGNITE elections coming up, she also encourages everyone to see the passion behind the candidate’s projects.